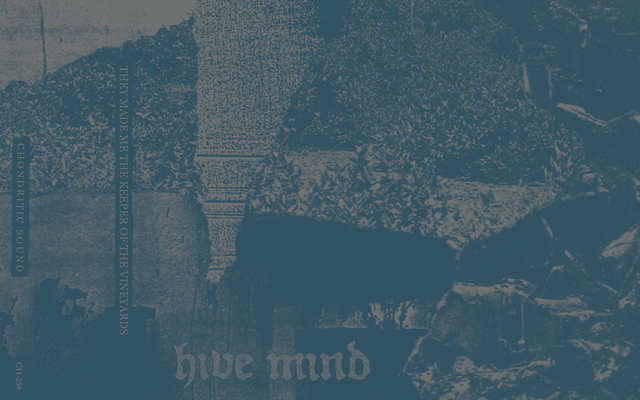 There’s a new Hive Mind cassette available, and it comes with a screenprinted 2×8″ patch with the “vines” logo on it. Labelled cassettes and blue-on-grey heavy linen stock art. In lieu of describing it, I’ve linked embedded the new Hive Mind BandCamp page for this release below. You can purchase digital or physical copies of the cassette. A lot of the older Hive Mind material is being added to the BandCamp at a “name your price” option for download, which means it’s free unless you want to donate. A Midwest/East coast tour is confirmed for the first half of May and I’ll be posting those dates here soon. They Made Me The Keeper Of The Vineyards was inspired by loneliness, desolation, routine, Dellamorte Dellamore & Marco Corbelli’s Morder Machine. No drum machines were used on these recordings.